Got a BIG shipment from PTI, and another on the way....it feels real good to get back into the swing of things. Today's card is for this week's CAS-ual Fridays challenged (CFC70), which was to use black and white, plus one color of our choice. 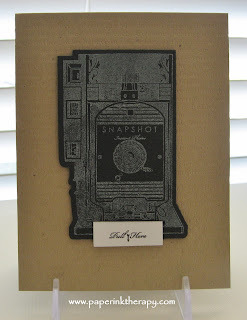 I love this stamp and die, you can make a fabulous and fun card so easily. I forgot to take a picture of the insert - when you pull on the slide, there's a little message waiting for the receiver...how cute is that?! I too love this PTI stamp set Trina, and you're right the little pull out is the perfect touch for a sentiment. Trina - what a great idea to create an interactive card with that cool stamp! Thank you so much for playing along with us at CAS-ual Fridays! Lovely card!Interactive cards are always fun to receive! Thanks for sharing with us @ CASual Fridays this week!